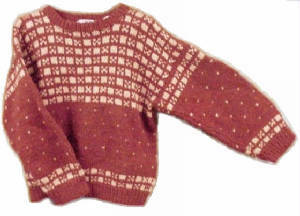 This kit is an easy, two color pattern that makes a striking pullover. It is available in small (38-40), medium (42-46), and large (48), and contains 7, 8, or 9 skeins of Bulky Weight Quinebaug Yarn. Color choices are Thames River Blue, Heather Blue, Teal, Norwich Rose, Purple Heather, Bittersweet, and Lilac Mist. Please specify item code and color selection (main color and contrast color) when ordering kit.